This pacakge offers the versatility of a comfortable place to sleep that is portable and can be set up in any room. 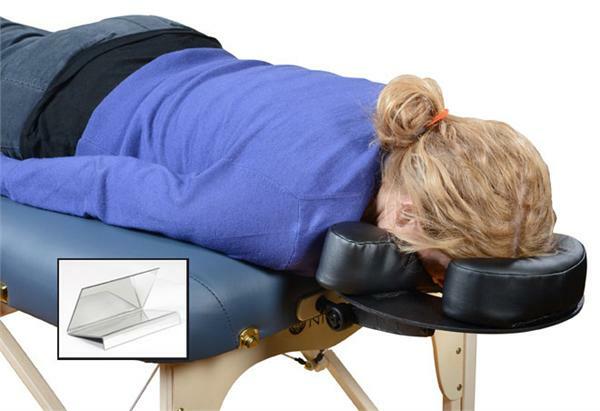 The patented table with comfort provide you with unparalleled comfort during face down recovery. The Breast Recess and Neck Contour work together to alleviate pressure on the breast and allow the spine to relax into a more neutral position. The Vitrectomy Face Cushion is designed for use with glasses and to accommodate any surgical dressing. The face cushion adjusts for comfortable positioning and can be used on seated and mattress supports. It is an ideal way to assist the healing process, asleep or awake. Our deluxe pacakge includes 2 tri-pad pillows with flannel covers. The Vitrectomy Mirror increases the number of normal seated activity possibilities while maintaining proper face down positioning. Visit with freinds, watch television, work on your computer or enjoy a panoramic view while resting. The price includes shipping and there is an additional $12 fee if you would like UPS to come to your home to pick the equipment up.